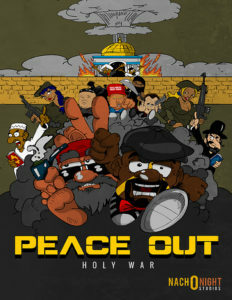 PEACE OUT: HOLY WAR chronicles the adventures of two mismatched peace symbols that have gone into business together to save the world. Produced by Nacho Night Studios and Eggplant Media, this Homeland inspired series is in active development of season 1, which sees our heroes face their biggest challenge to date… in Israel! Meet Fingers and Sym. They’re out and about on Twitter, doing what they do best… ur’ fighting for justice and breaking up fights!